In the first quarter of 2014 General Sign was contacted by Great Southern LLC, a Valdosta based General Contractor widely known in the multifamily residential building community. The Daniel Ashley Hotel was built in 1925 designed by the renowned southern architect Edward Emmett Dougherty’s firm Dougherty & Gardner. It served as the social center of Valdosta for many years. It was in continuous operation as Valdosta’s Grand Hotel from 1926 to 1973. In 1980, the hotel was transformed into a senior living facility known as the Ashley House. Over the years the neo-classical building deteriorated and in 2013 a property development group was awarded capital to revitalize the property. Great Southern was chosen as the General Contractor, and reached out to General Sign to design a period blade sign that would be similar to the original hotel sign constructed in the 1920’s. Originally, we intended to use L.E.D. instead of neon for a number of reasons, but were ultimately directed by historical planners on the use of neon. The design process went through several rounds of collaboration until a final design was approved by the property owners, GreatSouthern, and the Valdosta Historic Commission. The new sign would be a thirty-three foot tall blade sign with four steel mounts to the side of the building. The topper would be ten foot wide tapering down to five foot at the bottom. All copy would be illuminated by double-stroke neon in red and white running from the top to the bottom. The sign was fabricated at our facility in sections and to be assembled on site and in the air. Installation would prove to be the most difficult aspect of the job. The seven story building was in the center of Downtown Valdosta and due to traffic conditions, road closures were not possible. 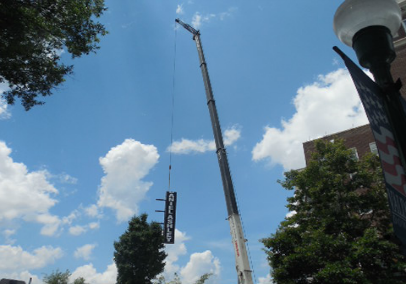 The decision was made to set a hydraulic crane in the rear parking lot of the Daniel Ashley Building, and for that crane to lift the thirty foot main blade portion and topper in two separate lifts. Meanwhile our installation crew preset mounting plates on the building wall via swing stage and prepared for the main lift to begin. The hydraulic crane lifted the blade and spanned the building, lowering it into place by directions of our ground and roof observers. The blade portion was lowered into place and welded onto the mounting plates installed just prior by our crews. After the blade was secured into place, a second lift came over the building carrying the topper of the sign and was lowered and secured to the main section. This installation took only two days to accomplish a testament to our experienced installation crews and the skill of our manufacturing and design department to build a very complex sign system for ease of installation.